I think it was in early November. I succumbed once more to an amaryllis kit. I had said I would not buy any of these inexpensive bulbs because so often the flower does not turn out to be the one pictured on the box. Red ones instead of pink, orange instead of white. 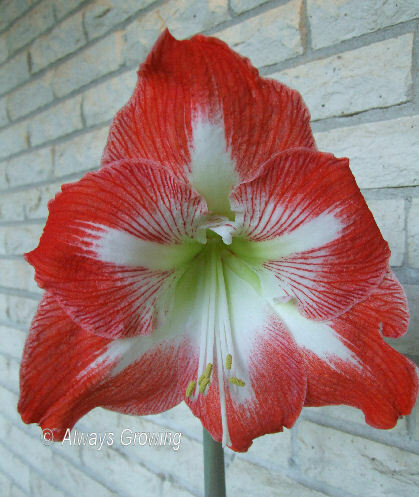 However, I just can’t seem to resist, so I purchased one that was labeled Minerva, an amaryllis I do not have. In the past, I have waited until the beginning of December to plant these bulbs because I prefer to have the blooms after the holidays. Mid-January can seem rather bleak after all the Christmas decorations are put away, and why have an amaryllis blooming in December when there are so many holiday items competing with it for attention? This year I didn’t wait to plant the bulb since last year when I delayed the planting, the flower stalk on that year’s amaryllis was already up and never did develop. So, in early November I planted my Minerva. 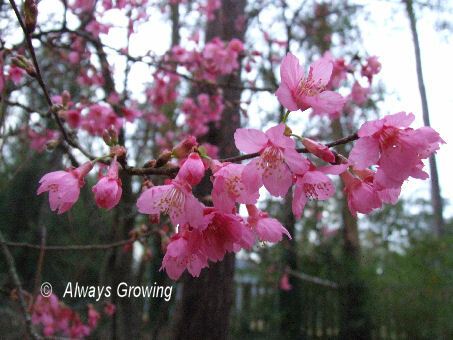 It didn’t bloom in December. 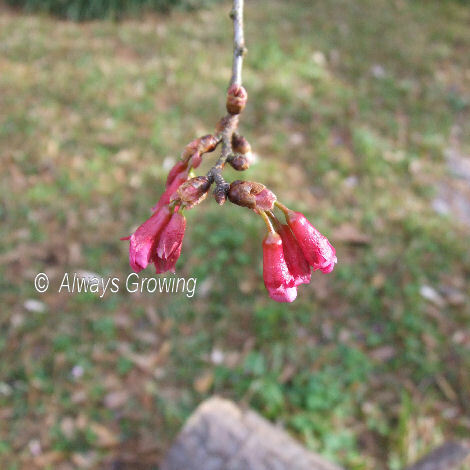 The bud showed but didn’t grow. It almost didn’t bloom in January. January is almost over and finally an open flower. I figured this was late because I kept the bulb outside since our winter has been so mild. 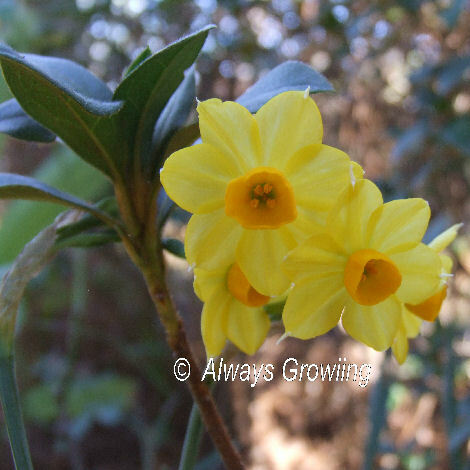 With the cooler than household temperature, that must have delayed the bulb from growing and flowering. I don’t mind the flower only showing up now because it certainly does cheer up the place since not too much is blooming right now. I never realized that it can be nice having a belated Christmas present from Mother Nature. 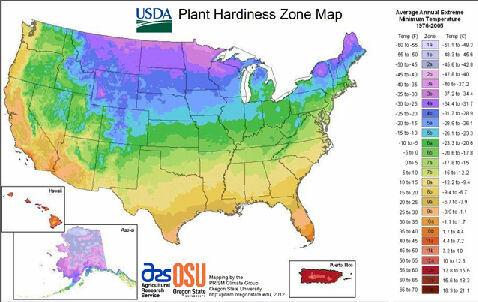 The USDA has issued another plant zone hardiness map, and many areas are now in warmer zones. The area where I garden, about 30 miles north of New Orleans, has been nudged from zone 8b to 9a. You can access the full info for your area here. This move does not surprise me, but I still am not going to trust that zone 9 completely. 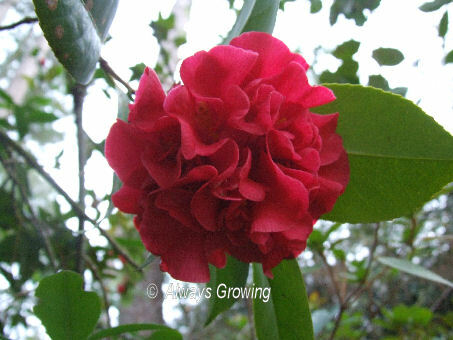 While it is true that our winters have been milder in general, we still can get a very hard freeze that will kill the plants that need a true zone 9 to survive. 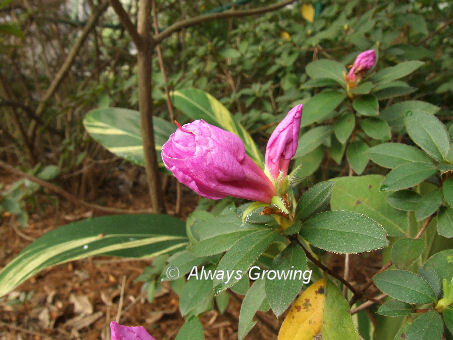 In the winters of 2010 and 2011, I lost many plants to the cold, and I know this will happen again. 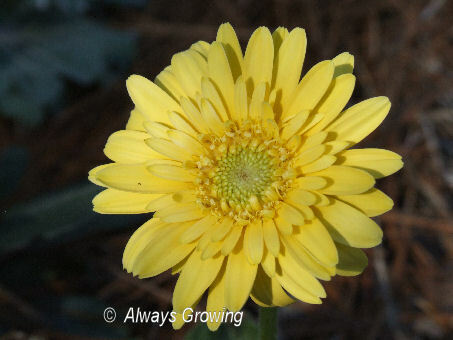 I have always felt that my garden may have the summers of a zone 9 or 10 and can have the winters of a zone 8 even if it is only for a very short time. 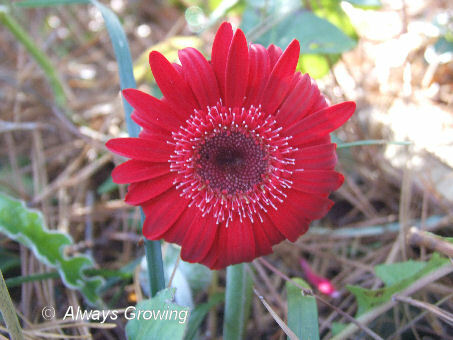 Tender perennials that survive in my sister’s garden (in the New Orleans area) will often succumb to the cold in mine. So, while I welcome this new map as guide and maybe as the years go by a true reflection of my climate, I still will garden with the idea that a zone 8 winter is likely and be careful about what I plant. It is always good to try something new. If it is a success, it is wonderful, and if it is a failure, you know not to do that again. 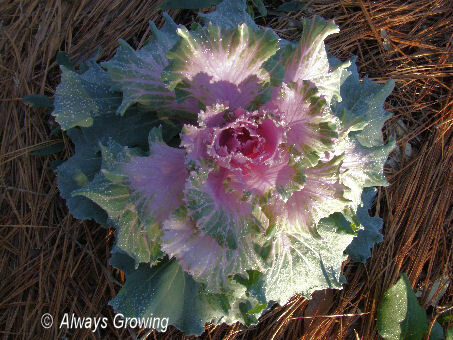 Something new I tried in the garden this past fall was some ornamental cabbages that I put in the circle garden. In the past I have planted pansies, violas, snapdragons, and bluebonnets in this garden area. My favorites had been the violas and pansies, but the last few years they just didn’t do as well as when I first used them here. They didn’t last and seemed to melt before they grew or bloomed. Since this was so discouraging, I had almost decided to not put anything in the circle garden when I came upon some ornamental cabbages at a small, independent nursery. They were tiny little plants in six packs, and it was hot and dry weather not good for fall annuals, but I planted them any way. At first, I was just happy they didn’t die, but then I was concerned they stayed green. The tiny plants, about the size of a silver dollar, grew and grew, however, they remained green. The weather grew colder, and there even were a few light freezes, but still little color. I kept looking at the plant tag, wondering if mine would remain green. 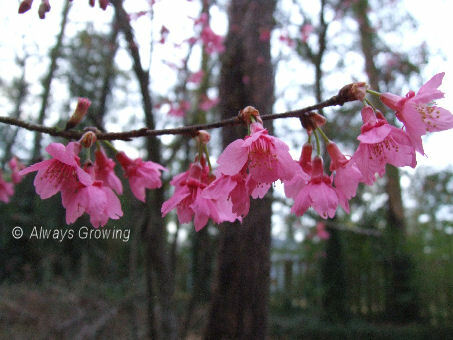 Finally, a tinge of pink appeared which soon expanded. I guess I was just too impatient. Now, they are the size of dinner plates with lovely pink centers. When I planted these cabbages, I really didn’t have high expectations for them. Now, they have definitely surprised me. I am so glad I gave something new a chance. There you are just going along your merry way, when bam you are brought up short. Hopefully it turns out okay. Sometimes we don’t deserve the good luck we have. It all started late Saturday afternoon. I decided to go out and work in the garden. Since it was late, I knew there wasn’t going to be a lot I could do before it was too dark outside to see. I started cutting out small trees that have popped up between our property and the vacant property next door. As I pushed to do just a few more and as it became dusky and a little hard to see, it happened. I tripped and fell. Luckily I wasn’t hurt, but I did get a scare. The clippers I had in my hand scratched just under my eye and continued onto my glasses. I have a pretty bad scratch and one small gouge on my eyeglasses and just a small scratch just under my eye. If I would not have been wearing glasses, the clippers would have hit my right eye and gouged it badly. I am so lucky all I got was that small scratch because it could have turned out so differently. One small thing can change your life forever. So, this is a reminder to be careful when gardening. Watch out where you walk so you don’t trip. Remember all those safety rules when using equipment. And, most importantly, don’t work outside when it starts to get dark, and you can’t see. You know it is bad when you are wanting to see something/anything that is growing so badly that mushrooms catch your eye. Even in the South there is not too very much that is growing in winter time, but lately, we have been having a lot of mushrooms show up. I think it is because with the high summer temperatures now gone, the moisture in the ground is able to build up and make conditions ripe for the mushrooms to appear. 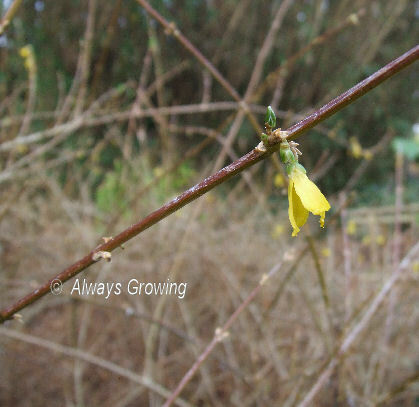 One type that showed up a while back in our more woodland area is still hanging on. 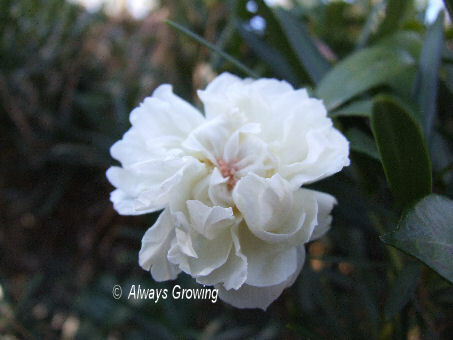 It popped up in late November, and while it is not in pristine condition, it has pretty much kept its shape. 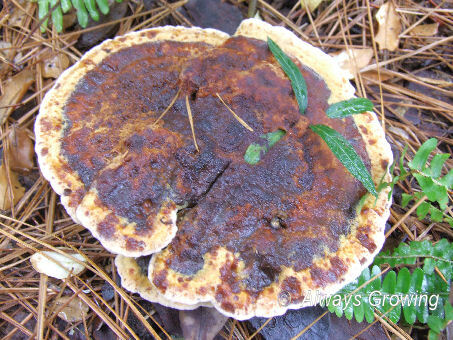 These mushrooms are hard, almost like wood. I find these to be very interesting. As they grew bigger, they would encompass plants around them. This next photo shows a small volunteer ruellea completely surrounded. Even a pine needle got stuck. 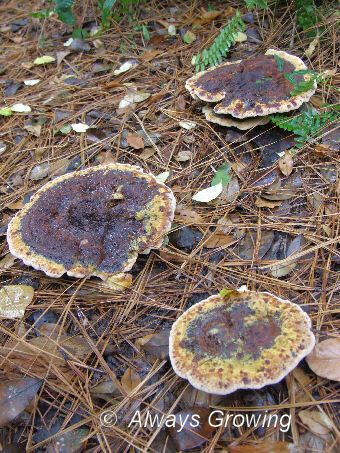 These photos were taken in late November, and now, in January, these mushrooms are still around, darker and a little crumbly perhaps, but they have endured freezes and still are hanging on. Tough little guys, aren’t they?